Metro plans to build a light rail line from the intersection of Exposition and Crenshaw boulevards to the Metro Green Line's Aviation/LAX station. A $546-million federal loan that will enable Metro to more quickly build an 8.5-mile light rail line in the Crenshaw District was announced today by U.S. Senator Barbara Boxer (D-CA). It is the first federal funding received for a Measure R transit project and will accelerate the schedule for completion of the Crenshaw/LAX line to the next five or six years; the Crenshaw Line was scheduled to open in 2018 under Metro’s long-range plan. The low-interest loan will be repaid with Measure R revenues. The funding is a major step forward for the 30/10 Initiative, the Metro policy that seeks to build 12 Measure R transit projects in the next 10 years instead of the next 30 by using federal loans and other financing. Senator Boxer announced the funding package in a conference call today with Mayor Villaraigosa, Los Angeles County Supervisor Mark Ridley-Thomas, Los Angeles County Federation of Labor Executive Secretary-Treasurer Maria Elena Durazo and Metro CEO Art Leahy. Mayor Villaraigosa was in Washington earlier this week to participate in a meeting with President Obama about upgrading the nation’s transportation infrastructure. An official announcement will be made at a press conference to be held next Wednesday. The $546 million loan from the federal Transportation Infrastructure Finance and Innovation Act (TIFIA) program will help get construction underway for the Crenshaw/LAX Transit Corridor project, an 8.5-mile light rail line in the Crenshaw District which will connect to the Metro Green Line and the Expo Line, currently under construction, eventually providing direct train service to a planned LAX transit center. Metro is currently preparing environmental documents and soon will begin preliminary engineering. Construction could start in late 2011. The Crenshaw/LAX line represents the largest public works investment in South Los Angeles in history, said Supervisor Mark Ridley-Thomas. “Not only will this project bring much needed economic development to an important region of the County, but these federal dollars will result in more than 7,800 much needed jobs for our community during the development of this project. I will make every effort to see that these jobs are allocated fairly to both local residents and those who live in ZIP codes that are most impacted by high unemployment,” said Ridley-Thomas. Here is a link to the news release issued by Supervisor Mark Ridley-Thomas. And here is a link to the news release issued by Mayor Villaraigosa. THIS IS SO STUPID!, IT STILL DON’T GO TO THE DAMN AIRPORT! There is already a Station that just a few mins from the airport. Why can it go to the terminals like other airports. Waste of money!!!!! I really hope this line gets extended up San Vicente to Santa Monica Blvd., then northeast on Santa Monica Blvd. to the Hollywood Red Line station. This is great news, but only because it gets this project out of the way. Seriously, this project alignment was a 100% political decision to appease the former county supervisor in this region. Just look at the route. It is great that this will connect with LAX, but how will anyone actually use this line to get to LAX? The transfer from Expo will be awkward and inefficient, and it will never make it north to Wilshire (too narrow). Tell me how anyone from north of Expo will find this line at all useful. Even people in Santa Monica or Downtown will be better off taking the bus than heading east/west on Expo, then transferring to go south on the train, then onto a people mover. And don’t try to tell me that hordes of people from Leimert Park will take the train to the Galleria or vice-versa. The only useful part of the line is the branch north from the Green Line to Century. But I guess the political decision was already made on this 20 years ago. What a waste of $1.4B. Somebody please convince me why this line is useful and I will stop whining. I agree that this is good news however I agree with IE Falcon that it should go into LAX and the terminals . I hope the new metro lines routes will travel into the most populated part of the city . Silverlake traveling down Santa Monica Blvd. to the beach . Yes, there MUST be a people mover at the closest LAX station that connects to each of the main terminals… To make this line even better and not another Green Line (nowhere to almost nowhere), the Crenshaw Line should have a northern extension that connects to the talked about “Pink Line” which would connect to the Hollywood/Highland station – Then one coulld take the Red Line from the Valley to Crenshaw and then to any terminal LAX… It would be a much improved straight shot to LAX instead of taking a indirect route like the Expo line, Green Line, etc. Our mass transit needs to be smarter and faster or we are just waiting everyone’s time and money! This is great news, the Crenshaw Line will be used by many people. 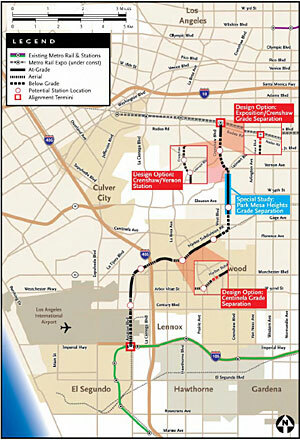 I also find it odd that Metro decided to build another LAX-adjacent (but not inside) light rail line. I’ve heard of plans to extend the Green, but wouldn’t that mean it would be two branches? I don’t see how that would work well. Hope I’m wrong . . . This line seemed like a perfect chance to correct the mistake made on the Green Line route. Oh well, I guess it’s the free shuttle or FlyAway for a while longer. Why will it take so long. It’s 8.5 miles. There doing 35 through a mountain in Switzerland in 7 years. Why is America so slow. What happened to us. I have to disagree with you, Donk. Metro has already indicated that they plan to extend the line north to Wilshire and beyond with a feasibility study that identified routes and indicated it was possible, if the line is underground at Expo, which is still one of the design options. Be sure to push in public comments for the underground option at Expo!! And what will be awkward or inefficient at the transfer with Expo? People change trains all the time in a large rail network. Seriously, if this line also doesn’t go directly to at least one of the terminals I’m going to start a citizen group to file lawsuits and demand corruption investigations (or more realistically donate to a group for this purpose that someone else forms). It would just be too insanely stupid to allow the pay-to-play political system to build a light rail lines 99% of the way to the airport and then stop AGAIN. I’m dubious about how the Crenshaw line got picked over a lot of other options to begin with, but not having it stop under the airport is just insane. Adding a separate people mover makes it a much less attractive and more time consuming route. 30/10 is a great idea, but a Crenshaw line that doesn’t go from anywhere to anywhere sure sounds like graft to me at this point. Once this line is extended north to Wilshire and then to Hollywood it will be indispensable. Here’s hoping it extends northwest on San Vicente to Santa Monica Blvd., then northeast on SMB to a Red Line Hollywood station. I disagree about objections to the people mover. A people mover can stop at all nine terminals and make sharper turns. JFK and Newark and other airports have people movers I do not believe they are onerous. If you’re going to have a station at Aviation and Century 1 mile from the airport, extend the line right into the airport. Part could be elevated with a stop at Lot C city bus center and when it reaches the airport underground it under the exit road between the parking lots with a stop for terminals 1 and7, 2 and 5,6 and one for 3,4 and the Bradley Terminal. It could also serve as a shuttle from Lot C and Between the terminals and hopefully airport funds could be used. Please reply. Thank you.